Curator Jonathan Berger interviews artist Stefanie Victor for the August 2013 edition of the Artist of the Month Club. Stefanie Victor lives in Woodside, Queens with her husband, the designer Julian Bittiner. They both make all of their work at home, in two bedrooms, which they use as their studios. I met Stefanie in 2006 at the Macdowell colony, at which time she was making detailed drawings of magnified textures from sweaters and other textiles she owned. We’ve remained close friends and central to many of our conversations is an interest in privacy, and the benefits that privacy affords us as creative people. I have come to realize that while our conversations are rarely explicitly about contemporary art, they contribute to my own idea of what is meaningful now. What Stefanie and I are doing is by definition, contemporary, and yet I think we often feel that who we are and what we do is misaligned with the prevailing value system around creative production. I had never seen Stefanie wear jewelry until she and Julian became engaged. Instead of a ring, he bought her a necklace made of four loops of linked chain. The necklace inevitably rearranges itself on Stefanie’s body because its structure is unstable. She futzes with it every time I see her, and because of these two things–her wearing it and touching it–the necklace is in a sense as a sculpture constantly being transformed. I recently asked Stefanie about her current work. Below is our conversation. Jonathan Berger: When I think about how I would describe your recent work, including the small object that you have produced for the AMC edition, I find myself at a loss, or more accurately, with a wealth of different possibilities. These objects could be sculptures, but their physical identity in terms of scale, material, association, etc., keep their identity fluid. They could be sculpture, jewelry, a functional object like a paperweight, etc. Could you talk about how you might describe or classify what you are making? Stefanie Victor: I would say I’m making fairly conventional art objects, at least in the sense that they have no hybrid status really. They’re not like a Donald Judd bed that looks like an art sculpture but you can actually sleep in it. You can’t put these sculptures on, and as a paperweights they’re a bit light. But yes, as art, they’re intended to refer to qualities that are often found in other types of things. They might bring to mind something that can be worn, and I hope they might also might elicit desire, which I think is something we’re more comfortable with as a response to consumer goods than to artworks. Also, their small size is typical of tchotckies or keepsakes – things that are meant to remind you of trips or explicitly to decorate your home. JB: We often talk about intimacy in relation to both of our creative practices and the experiences we want to give others. These concerns permeate everything I have seen you do. How do they manifest in the new work? SV: I think we have a different relationship to the things we have in our home than to what we see in the ‘neutral’ setting of a gallery, museum, or even a public space, not that these are bad places for art. We live with the things in our homes, we often touch them, we move them around, and we usually remember under what circumstances they were acquired – where, with whom etc. My hope is that the small scale of the sculptures, which lends them to easy placement on bookshelves or windowsills might draw out those kinds of associations, even if a domestic context is only imagined. You mentioned I only began to wear jewelry when I got married. Before that, jewelry seemed superfluous, non-essential, and at worst about displays of wealth. When I got married two years ago, I realized how jewelry can be intrinsically linked to meaningful people and events. That connection – direct, emotional, personal – is something I’m always wanting with art. In borrowing from the material, and often, structural vocabulary of jewelry, I’m hoping to shift the sometimes removed viewer/art-object relationship more toward the owner/jewelry-object one, something more intimate. JB: Could you talk about your interest in Margaret De Patta and other historical figures who’ve informed your recent work? SV:I came across Margaret De Patta’s work in a book on the history of craft. The image in the book was of one of her pendants, a really beautiful, precise, geometric arrangement of quartz and metal photographed against a solid background. The author made of a point of noting that De Patta never shot her work on bodies because she wanted it to be seen as sculpture. Through De Patta, I found other artists like Françoise van den Bosch whose work is well known in the discipline of jewelry, but not so much fine art. I’ve been interested for a while in those kinds of parallel trajectories, particularly in the 60s and 70s. 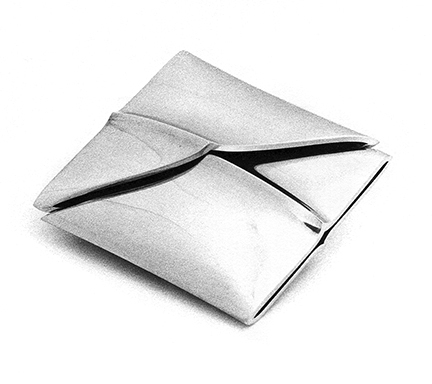 A lot of other artists I’ve looked to from that time, like Lygia Clark, Scott Burton, Ruth Vollmer, and Franz Erhard Walther, were thinking about not only vision but touch; not only theory but day-to-day experience, something these studio jewelers were directly engaged in as well. JB: You’ve said that you don’t think of the piece you’ve made for AMC as an edition, but this isn’t because each piece is unique. Why is this significant for you? SV: I really wanted each piece that people received to be “the real thing,” as opposed to a lesser copy or documentation of a thing. I originally worked out this shape in pipe-cleaner, had hands-on help forging a model from copper from Sung Qu Park, an amazing silversmith, and then worked closely with a caster. For me, the cast pieces are the only finished sculptures.